I’m super excited to share the news that I have a new chapter book series coming out this fall, 2019! 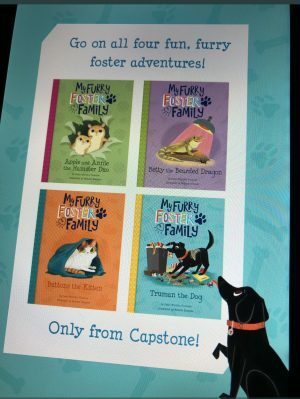 My Furry Foster Family (Picture Window Books/Capstone) is about an 8-year-old Japanese American girl named Kaita Takano who fosters pets with her family. There are four books in the series for 1st – 2nd graders. The books are adorably illustrated by Melanie Demmer. I was thrilled to be working again with my editor from the Dorothy and Toto books. And given my background with pets and animals, and my degree in zoology, it was such a joy to write these books! I’m excited to share them with you! If you happen to be a NetGalley member, you can read and review Truman the Dog. I hope you enjoy! I look forward to sharing the news when they come out later this year!